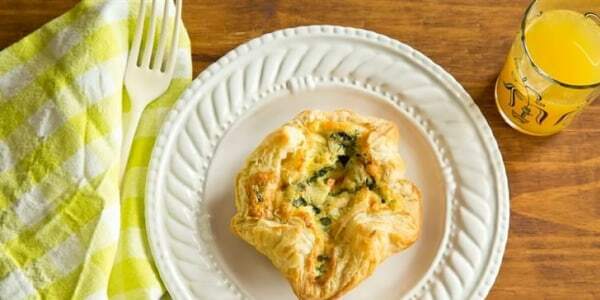 Make-ahead mornings: These easy baked egg soufflés freeze and reheat beautifully! With a savory filling wrapped in buttery, flaky dough, grab-and-go baked egg soufflés are a deluxe way to start the day. They don't have to be a special-occasion breakfast, though, when it's almost too easy to stock your freezer with homemade versions at a fraction of the price you'd pay in a restaurant! Four-inch tart pans best approximate the size of Panera's popular soufflés, but you don't have to run out and buy a set to bake up a batch. A regular muffin tin gives you nine mini soufflés that are just as satisfying and work wonderfully as individual portions. Pick your favorite flavor combination — you'll find instructions below for Spinach and Artichoke; Spinach and Bacon; Ham and Swiss; and Four Cheese — or experiment with new fillings. This article was originally published Mar. 23, 2015 at 4:53 p.m. ET.